When we were young, our parents, relatives, older siblings, teachers, and babysitters created protective boundaries for us. For our own well-being, they told us where it was safe and unsafe to venture. We were told such things as “You can go as far as the tree, but no farther. You can walk up to the corner, but never cross the street. Don’t go near the water. Never leave the classroom without taking the pass.” While all of these commands were meant for our own safety and well-being, they inadvertently also planted boundary seeds in our unconscious minds. As we got older, often times these protective boundary seeds grew into huge restraining barricades that limited our own choices and mobility. The best way to grasp the power and influence of this early restrictive programming is to view it in animals. In Deepak Chopra’s Magical Mind, Magical Body audio series, we find the following two examples of boundary indoctrinations. 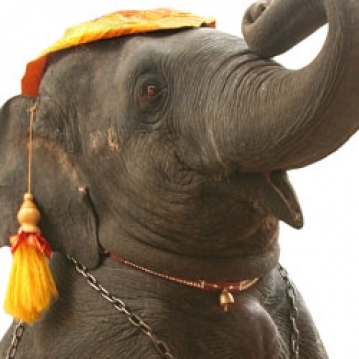 1) How To Train an Elephant In India, people train elephants in a fascinating manner. They take baby elephants and place a thick chain around one of their front legs. Next, they attach the chain to the base of a large tree. 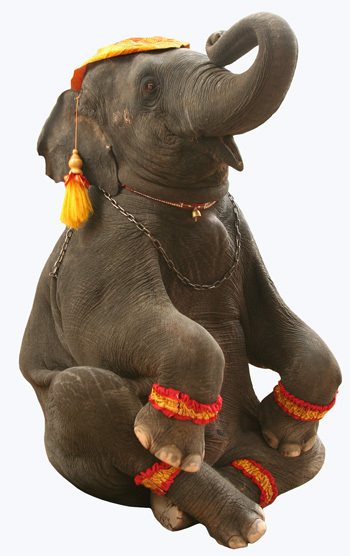 The little elephant quickly surrenders and does not try to break the thick chain or venture past the length of the chain. Here’s where the story gets interesting. As the elephant grows and becomes larger and stronger, the trainers replace the thick chain with thinner and thinner ones. They also attach these chains to smaller and smaller trees. Eventually, a thin piece of rope connects the elephant to a small tree. While the elephant now has the strength to snap the rope or to uproot the entire tree with its trunk, it does not. Instead, it chooses to perceive and react to the thin rope as a thick chain, and the small tree as a strong anchor. 2) How to Separate Fish Scientists conducted a revealing experiment with tropical fish. When we can gather the courage and take one more step beyond our perceived personal limits, what we will discover is that there is still ground beneath our feet. They partitioned a fish tank by lowering a piece of glass into the center of the tank. They arbitrarily put half the fish in one section and half in the other section. After some time the scientists removed the glass partition. Interestingly enough, what they discovered was that none of the fish ventured across into the other section of the tank. They became so “comfortable” in their limited little world that they were still honoring old boundaries and familiar terrain, rather than their curiosity. In a similar fashion, our old realities, obsolete beliefs, and current habits can often limit and negatively affect our new adventures and endeavors. Directly or indirectly, they have the power to diminish the permission we give ourselves to venture past our familiar boundaries and to stretch our own personal envelopes. Take a minute to dwell on the following question: Which areas in your life are you giving yourself permission to play in, and which areas are off-limits to you? More specifically which jobs are you afraid to apply for? Which exercise or diet program are you afraid to begin and stick to? What course are you afraid to sign up for? Which city are you afraid to visit or move to? Which potential customer or romantic interest are you afraid to call? What article are you afraid to write? What large sum of money are you afraid to earn or even talk about? Many people, after asking themselves the above questions, discover that they have a lot in common with elephants and fish. To guide yourself away from these “animalistic tendencies,” keep reminding yourself that while you do have a history -- you are not your history. Also, to create a new “history,” you first must embrace and accept your old history. While you may have had a past that was filled with limiting environments, boundaries, and relationships these experiences need not prevent you from venturing forward and into new, unfamiliar, and exciting areas.